I have seen the back to school sale flyers in the Sunday paper, the Blackeyed Susans are forcing themselves up between the cracks in the pavement at stoplights and you can buy 300 ears of fresh sweet corn for a dollar. This means The Great Minnesota Get Out and Sweat Together can’t be far off! 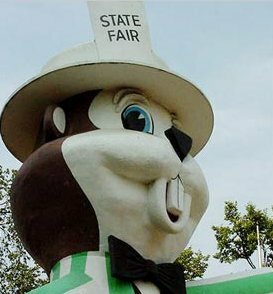 The Minnesota State Fair. Let me make a little confession: I am not necessarily a fan of the Fair. The reaction you get by announcing this to your fellow Minnesotan is like admitting you subscribe to Pravda in front of the McCarthy Hearings. There is shock, disbelief, and a perceived betrayal to our state’s heritage. I can’t help it, I just don’t enjoy pushing a stroller past exhibits of sheep, blue ribbon pies, and tiny bonsai trees. However, the State Fair does have one redeeming item, with an allure so powerful, I can endure the exposed, tattooed and pierced flesh, the Equatorial-Africa-like heat and the downwind drafts from the livestock exhibits: The Pronto Pup. Now the uninitiated should not confuse a Pronto Pup for a corndog, which goes from the freezer to the microwave. No, we are talking about a hot dog on a stick dipped in cornmeal batter and deep-fried before your eyes. Tastes equally as good as it is bad for you. They conveniently station the Pronto Pup stands no more than 100 meters apart so just as you are chucking an empty stick into the garbage can, you can step up and reload. Personally, I eat enough Pronto Pups in the last week of August to choke a small horse (incidentally, I saw a small horse choking at the Fair last year, but that is another story). I am sure that by Labor Day, my blood has the consistency of straight 30-weight oil in January and I have more nitrates in me than McVeigh’s Ryder truck did. By the time I waddle towards the exits, my pockets are blackened. You know, blackened with the kind of scorch marks that can only be generated by the spontaneous combustion of large wads of crumpled cash. Broke, sunburned and carrying a stuffed dinosaur the size of a Volkswagen, I walk the 3.8 miles to try and find my car I parked on some guys lawn. But I leave with the satisfaction that the Fair is another year (and if I don’t watch it, an angioplasty) away.